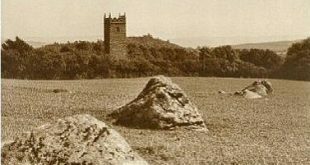 As you drive along the A386 between Okehampton and Tavistock you may notice a cross sited on a distant tor upon the skyline, this is ‘Widgery’s Cross’ or the ‘Jubilee Cross’. For 118 years the granite cross has stood looking over the western expanse of moor. The cross was erected by William Widgery to commemorate the Golden Jubilee of Queen Victoria in 1887. Widgery’s Cross holds three distinctions amongst the realms of Dartmoor crosses, firstly it is the only cross constructed of blocks of granite as opposed to being hewn from a single slab. Secondly it is the most visible of the crosses as it can be seen from many places on the moor. Thirdly the cross is the tallest of the all the Dartmoor granite crosses which stand outside of a cemetery. The cross stands on a tor commonly known as Brat tor, however, it has also been known as Brai, Widgery, Broad and Lur tor and stands at an altitude of 452 metres. Widgery’s Cross is constructed from 10 courses of granite blocks and is capped with a rough slab. It has been suggested that the reason for this method of construction was to give the structure a greater stability which when one considers the exposure of the site would help the cross withstand the elemental forces imposed on it. The cross reaches a height of 12.99ft and has an arm span of 4.5ft, the words “W. Widgery, Fecit, Jubilee VR” are inscribed on the eastern side of the base stone. Widgery’s Cross is orientated on a east – west alignment which assists in its visibility from afar. “this and its position, which is singularly striking, would suffice to show that the hand which set it up was guided by the eye of one who knew how to happily blend the work of art with that of nature.“, 1987, p117. “… stopped to look over his shoulder at his work. He could not recognise the view before him as that which the artist was painting. In the foreground instead of a marsh there appeared a rocky stream. ‘Mr Widgery’, said the visitor mildly, ‘there is no river at the foot of that hill.’ ‘Isn’t there?’ returned the artist, without looking up; ‘well’ there ought to be.” , 1966, pp121-2. In 1880 Widgery built a house and studio on the edge of Lydford where he lived for 10 years. This building is now The Lydford House hotel and from which can clearly be seen Widgery’s Cross and who rather fittingly now offer painting holidays. In 1861 Widgery had a son called Frederick John who went through formal art training and in later years became another famed and prolific Dartmoor artist. William Widgery died in 1893. One of Widgery’s patrons was an Exeter man called Kent Kingdon who purchased a number of his paintings and upon his death bequeathed them to the Royal Albert Memorial Museum in Exeter. Today, William Widgery’s paintings command a high price when they come onto the market they easily fetch sums in thousands of pounds. Personally, whilst both father and son have produced excellent work I do favour the work of Frederick Widgery as all his moorscapes truly capture the spirit and light of Dartmoor. Below are examples of both William and Frederick Widgery’s work and to me there is a delicate subtlety to Fredrick’s picture but as with all art, it is a very personal thing. Crossing, W. 1966 Dartmoor Worker, David & Charles, Newton Abbot. Harrison, B. 2001 Dartmoor Stone Crosses, Devon Books & Halsgrove Pub, Tiverton. Le Messurier, B. 2002 Dartmoor Artists, Halsgrove Publishing, Tiverton. Sandles, T. 1997 Pilgrimage to Dartmoor’s Crosses, Forest Publishing, Liverton. Starkey, F. 1983, Dartmoor Crosses, Starkey, Exeter.